The first option is to delete it from your dashboard. To do this, you hit the "…" or ellipsis button on the timer you wish to delete. 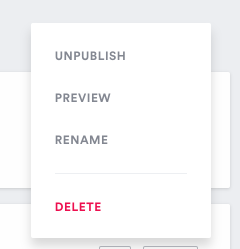 This will open an action menu with four options: (Un)Publish, Preview, Rename, and Delete. Hit the— you guessed it—Delete option to delete your timer. Because you cannot undo this action, we throw up a confirmation dialog to briefly explain this and make sure you didn't accidentally hit the wrong action. If you get cold feet, you can hit the Cancel button, otherwise hit the okay button and BOOM! your timer will disappear from the dashboard, never to be seen again. RIP My First Countdown Timer. Deleting timers from its respective action menu on the dashboard is the easiest method, but if you find yourself in the editor when you get the itch, you can make the cut from there too. Look down to the bottom of your window and you'll see a Delete button next to the Cancel button. Hit it and the same confirmation dialog will appear. Click Delete if you're absolutely sure you never want to see this timer again, Cancel if you just need a break, and a couple weeks without will have you crawling back for more.